US, 1943, 65 minutes, Black-and-white. John Loder, Ruth Ford, Warren Douglas, Paul Cavanagh, Barry Bernard. Directed by D Ross Lederman. A small-budget supporting feature from Warner Brothers as part of the war effort. In retrospect, it looks rather silly but may have appealed to the American audience at the time. Three military personnel, two men and a woman, crash land in Iraq which is held by the British. John Loder and Ruth Ford play an estranged married couple, Warren Douglas plays the gung ho pilot of the plane. It can be noted that the terrain looks rather lush, nothing like desert in Iraq, or even an oasis. They land in an independent kingdom which is somewhat affiliated with Hitler and the Nazis. The ruler is played by Paul Cavanagh, a different role for him, but in some ways he makes the film worth watching. He is silver-tongued, very cultured in manner and style and education, continually commenting on how Western powers look down on the Middle East as uncivilised (despite the thousands of years of culture). There are also some superstitions associated with demons, sinister high priest, the ruler taking over some of the ceremonies. Ironically, he has a very British butler who does not want to go back to England but he seems happy to collaborate, for money, with the Westerners to help them in their escape. The film also offers the opportunity for Ruth Ford to be decked out in a number of attractive gowns, even escaping back to the plane in a somewhat provocative evening dress. The westerners complain, try to contact Cairo, escape to the plane fairly easily in terms of knocking everyone out and getting on by foot while the locals have to reach the plane by horse. 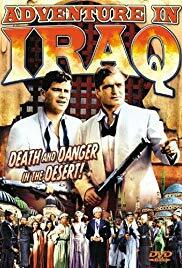 John Loder gives his life for the others pretending that he has not been able to contact Cairo – but, as deathly rituals get underway, Americans land and start to bombard. In a way the film is a bit reminiscent of cowboys and Indians, looking down on the inferior Indians, the presumptions of the white Americans about superiority, clashes between them – and the cavalry riding in at the end to save the Americans!